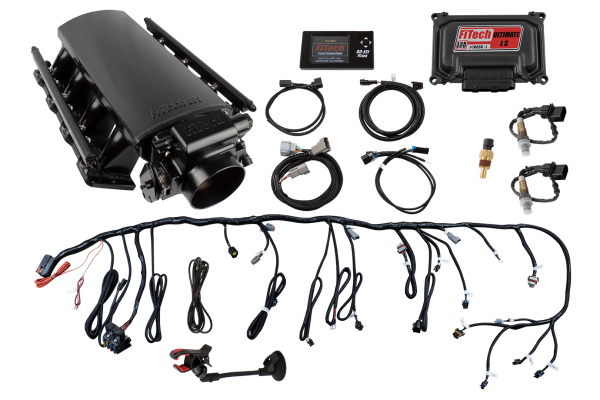 FiTech Ultimate LS EFI LS3/L93 750HP EFI Systems w/Trans Control 70014 | Proformance Unlimited Inc.
LS motors have a great base for power, but what they really need is something wicked to wake them up. FiTech LS EFI 750HP fuel injection systems have alarming power, exciting style, and will take you and your vehicle to the edge. FiTech fabricated many aluminum parts for these systems, including the low-profile 102mm billet throttle body, high-volume billet fuel rails, and an intake manifold with a 1,500 to 6,500 rpm powerband and 3mm construction. Sequential spark and fuel control mate the 55 lbs./hr. injectors, plug-and-play wiring harness, and color touch-screen self-learning ECU. This allows you to program two fan control outputs, most tach and speedometer output drivers, and target AFR and timing on the fly. A suction cup mounting bracket puts the controller at your fingertips and allows for impressive visual aids. The optional transmission control feature is suitable for 4L60, 4L65, 4L70, or 4L80 GM transmissions. Awaken the beast and feed its needs with ultra-performing FiTech LS EFI 750HP fuel injection systems with transmission controller.